Self-Paced With Lifetime Access - Price: £49 / $63 approx. Do you adore portraiture and all things vintage? In this class, you'll be creating three portraits, pretty and expressive 'tea bag' portraits, together with a (bonus) mixed media piece. Not too sure how to use charcoal, soft pastel or watercolour - no problem, I also share hints and tips for each. There's more - an art history slideshow/presentation and a little delve into the lives of some inspiring women from this era. After purchase, you will receive an email with details on how to access the private classroom. Create a charming watercolour using a monochromatic colour scheme. 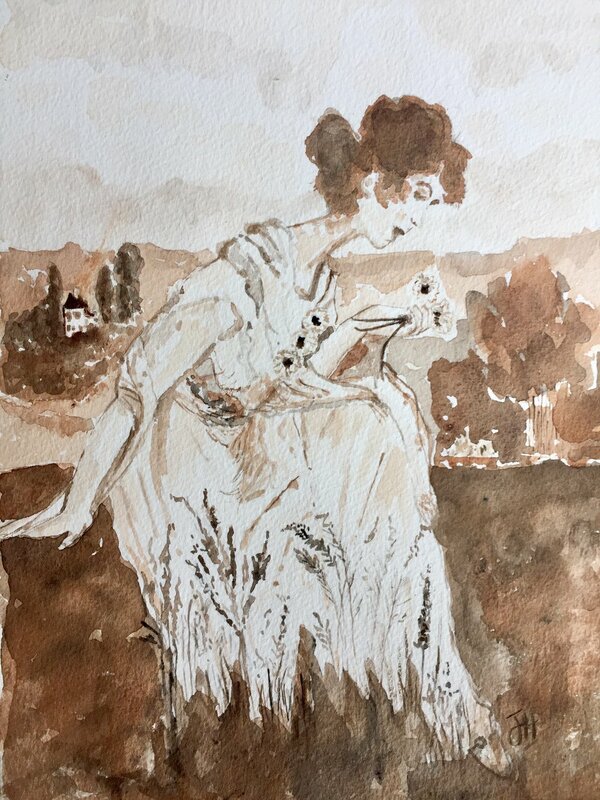 Learn what a monochromatic scheme is and how to achieve this beautiful effect that is reminiscent of an old sepia photo, with just one colour. Create an evocative piece using charcoal. Enjoy blending layers of charcoal and building up tone, form and line in order to give depth, emotion and realism to your piece. You are going to be astounded with this process! Soft pastel is beautiful to work with and gives a really feminine touch to your piece - ideal for this period in time and those beautiful outfits. Don't you just love this style of hat? For those of you who haven't experimented with photo transfers, here's your chance to open up a whole new dimension and vista to your projects. 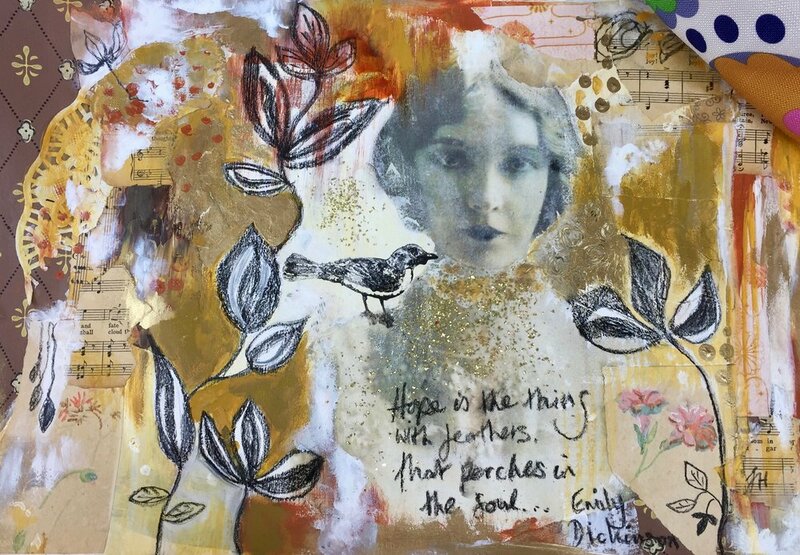 From this foundation, we will create an intuitive, loose and meaningful mixed media piece using ephemera, mark making techniques and acrylic paint etc. 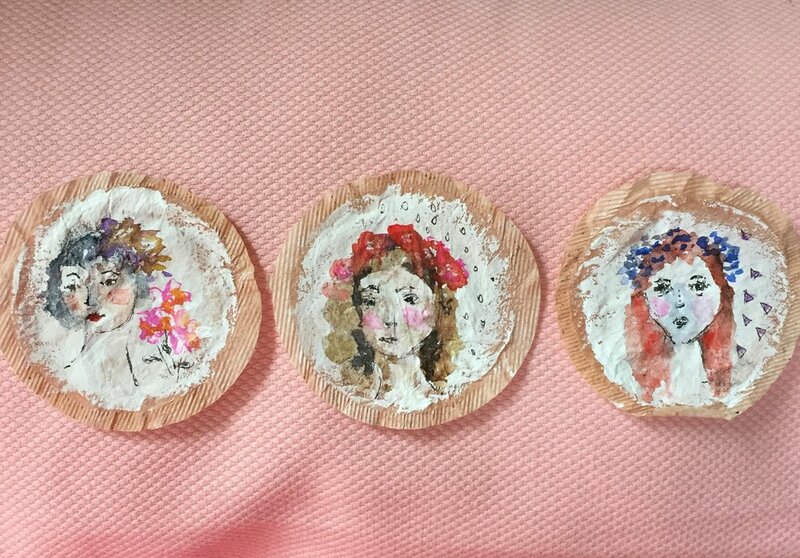 A fun way to warm up - three mini mixed media portraits on tea bags! Let your paint flow and enjoy this expressive process that translates beautifully to other styles of portraits that you may do in the future - you'll love it! As a bit of a social and art history buff, I had to include a slideshow with a sprinkling of art history and in addition, share some inspiring stories of some amazing women from this time period - it's a great pairing! * The items above are what I’ve used but please feel free to substitute if you need to. Once I pay for the class, how long will I have access to the lessons? We are all busy and I understand that time is in short supply. You'll be happy to hear, that you will have access for the foreseeable future ie. for as long as I am operating my website and business. Where possible, art videos are downloadable for you to keep. Your payment is securely handled by using either a credit card or Pay Pal. Be assured that this is a secure connection and you will notice the lock icon in your browser - this shows that your information is safe and secure. Payment is shown in British Pounds - do you accept other currencies such as Dollars/Euros? Yes! Once you pay, your currency is automatically converted when you check out using either a credit card or PayPal. If you'd like to check your current exchange rate, I've found this site to be useful. How do I access the class? You'll receive a purchase confirmation and another email with your personal login details for your class. I'm sorry but refunds are not available for online classes. Can I buy this class for a friend? Yes! After payment, please provide me with her email address and I can send her the necessary details. Why not purchase a digital Gift Card? Better still, do the class together - just get in touch and I'll be happy to give you an overall discount. Please contact me here - I'd love to hear from you. An artist and online teacher, I’m passionate about sharing soulful, creative and practical tools that I’ve discovered through life’s challenges. My journey has encompassed depression, the life-threatening illness of a child and a transformative reconnection to art-making that felt like 'coming home'. I’m learning to approach life and all that it entails from a place of gratitude, warmth and honesty through the lens of my faith. I love helping women slow down, reclaiming their identity and finding a sense of renewal and contentment that ripples throughout life using creativity.. I live with my husband and our two teenage boys in a beautiful rural village in the heart of the Yorkshire Dales in the UK.